We are delighted that you are interested in finding out more about our exciting new school which opened in Jupiter Drive in September 2014. The school has been proposed to meet the present and future needs of extra primary school places in the town. The new school was built on the site left vacant in 2007 by the closure of Jupiter Drive Primary School. We are a free school, that is an Academy on opening, which means we get our funding directly from the Government to educate the pupils here. We have a number of significant freedoms to create our own curriculum, staffing and learning hours that will develop further as we grow. The school has 5 year groups presently EYFS (Year R), Year 1, Year 2, Year 3 and Year 4.with 60 places spread across two classes. Currently our Reception and Year 1 classes have 3 classes of 20. Each year we will open a new Reception year group of 60 until the school is at full capacity of 420 pupils in 2020. Each Year we consult with a wide variety of stakeholders to determine the School Improvement Plan. See below for this years plan of action. 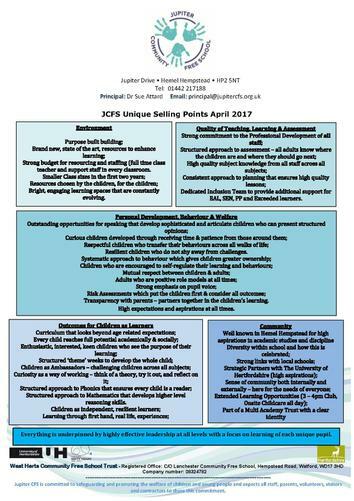 Stakeholder's views about what makes our school unique.